Over the years I switched from stick antiperspirant to spray and well it recently felt like a good time to try some spray deodorant out. 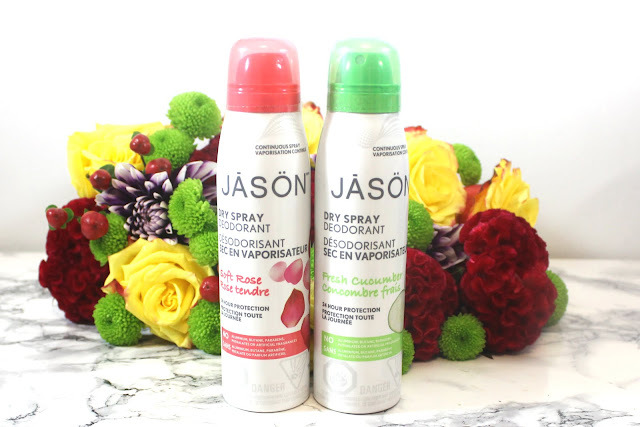 Jason was kind enough to send me their Dry Spray Deodorant in Soft Rose and Fresh Cucumber. As you may or may not know, deodorants don't stop sweat like antiperspirants do, they just stop you from smelling. It is a much more natural concept and is great for anyone looking to have a more natural or clean body care routine. 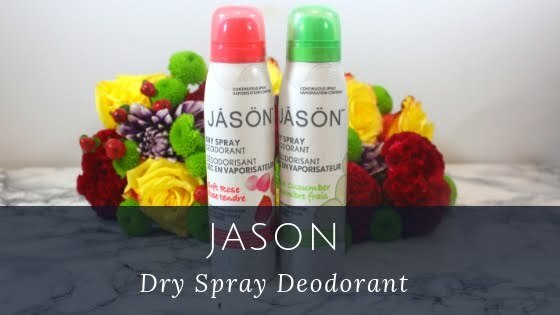 The idea of a spray deodorant seemed a bit odd to me since the majority of my experiences with deodorants have been with liquid roll-ons and sticks. 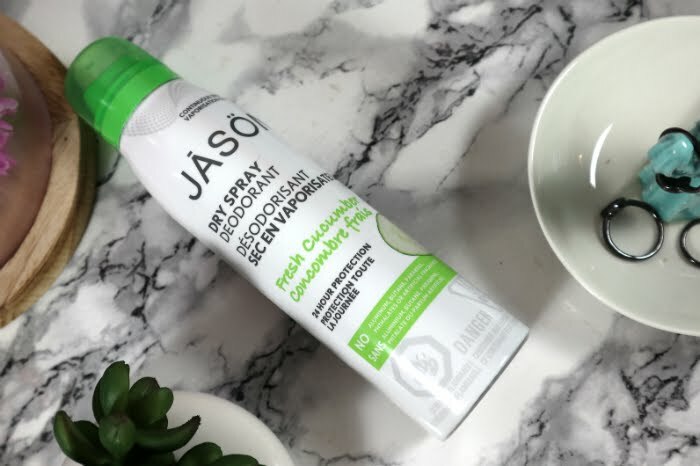 I learned that Jason's spray is air propelled making it a great option for those eco-conscious consumers who want to avoid chemical propellants. It also has no aluminum, parabens and is vegan. The sprays go on without any residue, I get no white marks or anything of the sort on my clothes. 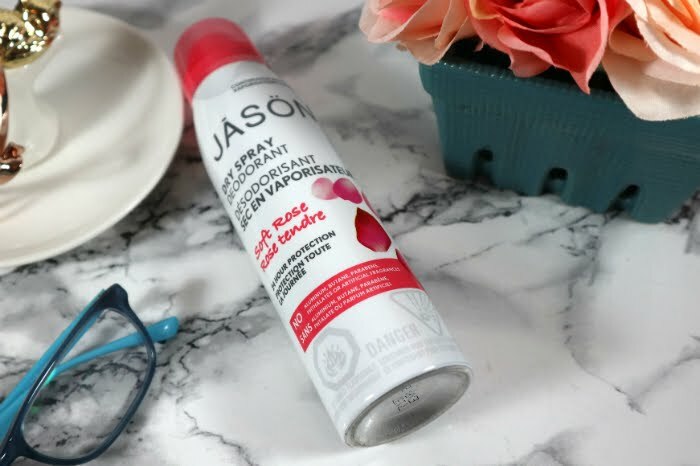 The spray is easy to apply and has a steady flow to it. It also dries instantly, so I am not left with a wet armpit, something I really hate. So how did it wear on me? I actually really liked it. I was skeptical, really really skeptical, but the sprays proved why they have won a Best in Beauty Award from Allure. It sprayed smoothly, dried instantly, left no residue on my skin or clothes. All off to a good start. Both the cucumber and the rose smell really nice and fade to a subtle scent after the first few minutes. As for stopping me from smelling, it worked really well in that department too. I found by the end of the day I didn't smell. I did find I could pull it off a second day without a shower if I reapplied in the morning, but not any longer than that. The only real tip I can give is, do not, under any circumstances, apply this product right after you shaved your armpits. Do not do it! It will sting, not a ton, but enough not to like the feeling. Overall I really have been enjoying using both sprays, I am actually shocked at how much I do not miss my antiperspirant. I cannot say this will be the case come the summer when the heat and humidity start to make me go into hyper sweat mode, but for now, it has been fantastic. Have you tried any deodorants lately? What do you think of them? *Products were sent for review, all views and opinions are my own.